Oops - we don't appear to have a video for the Strobe XP200 VRS. 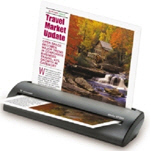 The Strobe XP 200 is perfect for users who need a fast scanner with a small footprint. Compact enough to fit neatly on your desk and pack easily alongside your laptop or in your briefcase. Portable enough to take anywhere because of it's slim and compact footprint. Powerful enough to scan and organise all of your documents photos articles brochures and business cards. Whether you're in the office or on the road the Strobe XP 200 will lighten your load.